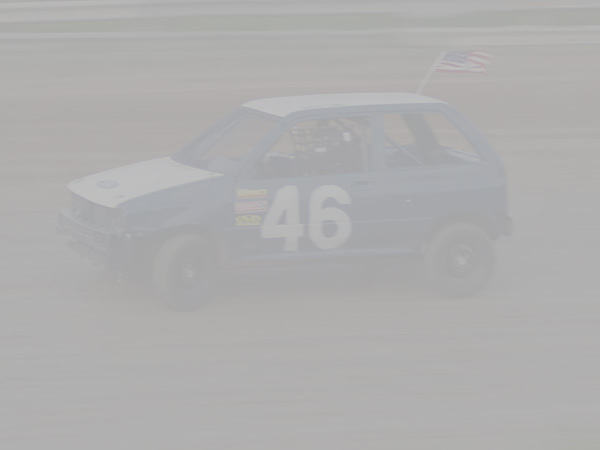 Welcome to the Festiva Racing Website, home of "The Little Car That Could". We are based out of central PA. We race primarily at the Dunn Hill 2 Speedway and Clinton County Raceway but could be seen at other local short tracks. Festiva Racing has been running since 2003 and has run in over 100 races. Festiva Racing's shop consists of 2 race cars and 3 parts cars all Ford Festivas. The #46 Festiva is driven by David Fink. In the 2009 season the Festiva had a tough year after being in one of the wildest 4 cylinder rolls ever at the track but still came home in 5th place in the points. In 14 races at Clinton County the #46 would get 1 heat win, 1 feature win, 8 top 5's and 11 top 10's. In one race at Dunn Hill 2 the #46 would get 2nd. For the 2010 season the Festiva Racing is proud to accounce our 3 main sponsors will be returning. Hookers Garage in Williamsport. SDF Computers taking care of all the website needs for Festiva Racing. The Job Shop in Cogan Station. July 3 - First Videos of the season are up. The videos from the July 1st race are up. They include spectator and incar of the heat and feature. We were lucky as there were no problems with either the incar camera or spectator camera. It was a little dusty on the track so it makes coming off turn 2 a little tough to see. July 1 - Festiva Racing makes a special appearance at Clinton County and comes in 7th place. The Festiva race team has taken 2011 off until this point. Over the winter we lost out primary sponsor and expenses have gone up to the point that we are unable to run every week. One of our favorite races each year is the 4th of July weekend race. We get to put the American flag on the car and our tradition of handing out glow necklaces. We figured this would be a great time to fire up the Festiva and go racing. A huge car count at Clinton County as 29 drivers made it to the track. David Fink would pull pill number 28. This would put him 7th in the 2nd heat. In the heat race it would get off to a wild start as cars would go 3 wide in turn 1 and 2. David would keep the #46 Festiva to the low side and work his way into turn 3. A car on the high side would then lose control and dive down the track collecting the #80 and getting a piece of the #46. David would get turned sideways and as he started to collect it would get hit again sending him spinning the other direction which would then cause him to get hit a 3rd time and sent down in the infield. Even after looking like a pinball coming off turn 4 the Festiva would continue on and restart in 5th spot. When the green dropped David would start to work the high side and attempt to pass the #64T however he would run out of room and be forced to lift allowing 2 cars to pass to the inside. David would quickly pass the #97 back however there would be some more contact in turns 1 and 2. Things would finally settle down and David would run the final 5 laps in 5th place unable to gain any ground on the #28. The car was very loose entering the corners which made it tough to make up time. This would give David the 14th starting spot in the feature. In the feature there would be a lot of action with 29 cars starting the race. A few drivers were a bit to quick to start and they would end up doing a complete restart. The second start would be much better. David would move to the high side and begin to work on the #15. There really wasn't room in the high groove as the #15 would move up several time which would cause David to back off. The first caution would come out and David would find himself still in 14th spot. After the green dropped, the first pass of the night would be made on the #64 coming off turn 4. David would be just ahead of him as they crossed the line and the yellow came out again for the #10J. Now the #46 would be right behind the #8m and would look to pass on the next restart. David would shoot to the inside and try to complete the pass multiple times however the 8m would keep fighting back using the high side momentum. With 5 laps to go a big wreck would happen causing the #77x to roll over and bring out the red flag. With 5 to go the #46 was up to 8th spot due to the 77x dropping out, another car was removed for rough driving and a third car would have a flat tire. When the green dropped again David would try to use the low line. The 8m would slide up higher and higher each lap and with 2 to go the #46 would inch out in front but the #8m took the spot right back in turn 1 and 2. David would get right behind and set up for a last lap pass. Going into turn 3 on the final lap the #46 would cut low and be ahead of the #8m coming out of turn 4. As the came to the line the #8m would make a charge but David would win by a bumper finishing in 7th place. A good night for the first race of the season and having to start back in 14th spot. Festiva Racing is not sure when the next race will be that they will run. We hope to make some more before the end of the year but its still up in the air. Oct 4 - Final Videos of the season are posted. With most tracks done for the season it looks like these will be the final race videos of the 2010 season. The last race at Clinton County was a 25 lapper which was much longer then usual. This made it tough on the youtube length restriction so there was one lap just before a caution that was cut since there was not much racing going on. The videos that are are the site to download are full length. Other then that no problems with the camera this week. Oct 2 - The #46 finishes just short of getting the win in the final race of the season at Clinton County. The Festiva race team had not been at Clinton County since the first week of May after running for a championship at Dunn Hill 2. It would be the season ending finale at Clinton County making it $300 to win and a 25 lap race. David was hoping for a good pill draw to make it a little easier. That wouldn't happen as he pulled the worst spot of anyone and would have to start 10th place in the first heat. In the heat race David would have to be aggressive as he needed to finish in 4th to make the redraw. On the start he would use the high groove to his advantage and pass 2 cars moving into 8th spot and would start to work on the #5 car. As he was battling a pileup would occur in turn 3. The #25 would lose a right rear tire and slide sideways in front of the field. While the car kept going officials would force him to pit. This would move David up to 7th for the restart. On the restart he would dive low on the #07 and then begin to work on the #21. As he would race side by side with the #21 they would come up on the #99 who would be slowing. Just as they got next to the #99 a wheel would fall off that car sending it out of control. Both cars avoided the scare and David would be ahead of the #21 at the line which would put him in 4th place for the restart. This is exactly where David needed to be so he started to take it easy. The leader would then begin to develop problems and 2nd and 3rd place would catch him and then make it 3 wide. David watched the great battle looking to maybe gain a spot or two before the checkered. As they got the white flag the #81 would start to have sparks come out from the car. Going into turn 3 parts would start to come off including some of the rear bumper causing David to take action to avoid it. He would manage to not hit anything and cross the line in 4th spot. In the feature David pulled pill #4 so he was starting on the outside just where he wanted to. When the green dropped it would be a good battle toward the front. The track was hard and slick with some holes going into both turn 1 and turn 3. This would force David to try to find a slightly different line to not beat up the car. With the extra laps there was a good chance this was going to be an endurance race. After a couple laps the #50r would run down the #46 and pass low in turn 1 and 2. The #50r would try to take the spot before he was clear and David would make contact. A caution would come out for a car the spun in turn 4. David was running in 5th but the #50r would be penalized two spots for jumping on the initial start moving David back to 4th. When the green dropped it wouldn't take long for the #50r to be battling with the #46 again. Going into turn one David would get a but push from behind to try and keep him in front of the #50r but it would be at a bad time sending him sideways down into the #50r. The 2 cars would be stuck together for a little bit before getting loose coming off turn 2. The #66 would then pass David coming off turn 4 putting the #46 back to 6th. After another caution David would fight hard to keep his spot. The #37 would try to pass low and after 4 laps of trying he finally would make the pass. A caution would come out several laps later for the #77 that would have problems and stop on the track. On the restart it would be wild up front with the top spots being swapped and a little rubbing. It turned ugly going into turn 3. The #50r would drive the #16 sideways up the track and started him rolling. The #81 with no place to go would slam into the #16 as well. Everyone would be ok but the #16 and #81 were out due to damage and the #50r would be thrown out for causing the roll over. During he red flag the #37 would develop a leak and have to go off track which meant in just 2 laps 5 of the top 7 cars were out of the race. This put the #66 in the lead with David right behind him in 2nd place. On the restart David would peak to the inside in turn 1 and 2. The #66 would get a slight lead but David would cut it down again and would be right there waiting to strike. Also waiting was the #18 would was looking for a way to get around the #46. All 3 cars would battle hard but track conditions would make it hard to pass. On the final couple laps David would have a nose under the #66 but was not able to keep it down the straights. He would have to settle for 2nd place. A great finish to the season but frustrating being so close to the win in a big money show. Sept 22 - Upcoming races up in the air. Festiva Racing was scheduled to run at Clinton County for the final 3 races. Clinton County has changed the schedule and dropped the Sept 24th race and the only race there is Oct 2nd. We are looking into other tracks but at this point it looks like we will be off this weekend. Sept 21 - Final Videos of the season up for Dunn Hill. The last Videos of the season are up for Dunn Hill. Like past weeks had a little mud problem. The last couple laps of the feature its pretty hard to see. A small piece is on during the heat. It would be the final race of the season and the #46 was looking to go out strong. Another solid car count and with the rainout at Clinton County several of their drivers made the trip to Dunn Hill. The FWD class was scheduled to go off first on the night and David would be in the 3rd heat starting in 2nd. At the start of the heat race the #7b would have the advantage down low. Going into turn 1 the #7b would make the turn a little later then David would want and it forced him into a late entry and allowed 2 cars to pass low. The chase was on from there. The top 3 were in a great battle and David was trying to run them down. Each lap he would cut a little more into the lead of the top cars but he would run out of time. It was enough for David to qualify for the handicapping and it give him a 5th place starting spot for the feature. To start the feature it would be a pretty good start as David would pass to the outside of the #88 but he would get passed by the #21 keeping him in 5th place. It was 5 laps of clean and green racing before the first of several yellows came out. There would be 4 yellows in 4 laps. David was able to take advantage of all the restarts and moved up to 3rd. He did move into 2nd but the yellow came out and he had to move right back to 3rd. When the race finally got going again David was right behind the #16 looking for 2nd place. While he was trying to pass the #16 the #68 would get to the low side and make the pass. One lap later David would get around the #16 and try to chase down the #68. The #42h would use the low line to make a pass but he couldn't run away from David. The #42h would get a little sideways entering turn 1 allowing the #77 to shoot to the inside putting the #46 back to 5th however problems for the #68 would drop him from the race 1 lap later. David would be right there trying to make a pass on either the #77 or #42h as they battled side by side but he just didn't have enough. In the last race of the season at Dunn Hill David would take 4th place. Sept 14 - Videos from Dunn Hill 2 are up. Videos are posted but the incar had a problem with mud again in the feature. It blocks about 1/2 the view until 5 to go when the caution came out and the camera was wiped off. Sept 10 - David brings the Festiva home in 5th place after another good race. With 2 races to go David was looking to lock up 3rd place so there would be no pressure in the final race of the season. It was an overcast day with dark clouds all around the track but the rain held off at race time. When the lineup was posted David would be starting 3rd in the 2nd heat. In the heat race the track would be a little interesting. It was very soft with some rough spots down low. David had the plan to jump to the high groove as soon as he could. When the green dropped that is exactly what he would be able to do. The #19 wouldn't get a good start and David would pull up behind the #42h. He would follow past the #62 to move into 2nd but it wouldn't last long as the #4b would use the low line to make the pass. David would then move all over the track to find something that would work for him. With some lines he would maintain the gap between 2nd and with some he would lose ground. Overall he didn't find anything that gave him an advantage and he would end up taking the 3rd spot in the heat. For the feature David would be scheduled in 6th spot. He would try his luck up in the high line which might not have been the best call. Several cars used the low line to pass as it was a jam up in the high groove. When things started to get single file David would find himself all the way back in 9th. He would then battle with the #62. It would be a good one too as in turn 1 and 2 the #62 had the advantage and coming off turn 4 David would have a huge advantage down low. After almost 8 laps of setting up a pass David would finally get by and begin to chase down a 3 car pack. Several cars would drop out due to mechanical problems moving David back to 6th place. The caution would come out on lap 15 making it a 5 lap run to the finish. When the green dropped the 7 car would have problems and David would get by moving into 5th. He would then work on the #2 car. He would use the low line he found earlier off turn 4. As soon as the #2 would see the pass attempt he would then try the same line. The #2 and #7b would battle side by side leaving David to sit back and watch. The checkered flag would fall with the #46 in 5th spot. After the points were figured up David now has 3rd spot locked up even it he doesn't show so there will be no pressure heading into the final week at Dunn Hill. Sept 6 - Videos are up but incar camera gets hit again. The incar camera must attract mud. In both the heat and feature it got mud on it. The heat race was affected a lot more then the feature. While you can still see in the heat its not a great view towards the end. There was some wind during the feature so the sound gets a little funny on the spectator camera but overall great video. Sept 3 - The #46 gets 4th in an amazing 5 car battle for the win. With just 3 races to go in the season its getting down to crunch time in the points. David is currently in 4th with a chance to get to 3rd if he has some good runs to finish out the season. For the heat race the #46 would be starting 1st in the 2nd heat. This would be the last week of good handicapping that was a result of the 1 bad week when the axle broke. In the heat it was a much different track then it had been the last few weeks. It had a lot more traction and it would show when the green dropped. The #42h would get a run on the outside which was the best groove and take the top spot but David would stay right with him. The #46 would be all over the back end of the #42h and peak to the low side coming off the turns. The Festiva was handling great and had a good advantage in the corners. David would keep looking to the low side but just not enough grip to get a real run and he would have to settle on 2nd spot. Just after the heat race was over the rain would come. The Festiva crew would get quickly get the car into the trailer and wait out the storm. It was quick shower and the track crew would immediately start running the track back in. For the feature the #46 was scheduled to start 3rd and David was hoping the track didn't change much due to the rain. When the green dropped for the feature the top to were battling hard. It looked like the high groove was going to be a little fast so David would pull up behind the #7b and begin to work on the #88. They would have a great side by side battle before David would take the 2nd spot away. He would then close in on the 7b and follow him for a couple laps before beginning to peek to the inside. While he started to work on the #7b the field would begin to work on David. The #77, 16, #42h were all right there running side by side. The #77 would use the extreme outside and take the lead but it only lasted for a second as the #16 would shoot to the middle making it 4 wide and take over the lead. David would still be in 2nd and was working over the #16 just like he had done with the #7b. He really liked the low groove and it was giving him a strong chance at the lead. The #77 would return using the extreme outside again. As they caught up to a lap car the leaders had to get 2 wide as they went by. The battle continued on and now the #4b was in the mix. He would use the high line to move into 2nd but lap traffic would get the best of him. David continued using the low groove while #77 and 42h would move to the middle and high lines. The top 5 cars would battle back and forth swapping spots almost every lap. With 2 to go David would find himself in 4th place but still right in the mix. He just wouldn't have enough in the low line and would finish in 4th spot in one of the best races all season. There was only a little rubbing and the race went caution free. Dunn Hill 2 announced during the drivers meeting on Sunday that for the rest of the season in any division if 20 cars start the feature it will pay $500 to win that race. Normal payout for the 4 cylinders FWD class is $125 so this is a huge boost. Any Clinton County drivers that have nothing to do Sunday afternoons are welcome to come to Dunn Hill 2 to race. Visit http://www.dunnhill2speedway.com/ for complete rules and info for the track as there are a few minor differences. If you have any questions about the track or racing there you can contact us and we will try to help out. April 25 - New driver link added. April 4 - New Links added. Festiva Racing is currently scheduled to take part in all but 1 races that has the 4 Cylinders at Clinton County. The full race schedule is listed from the link below. Basic Machining - Precision Engine Assy. http://www.woodhullraceway.com/ - Located in Woodhull, NY with racing Saturday nights. Festiva parts for sale. Having multiple Festivas we have gotten a good supply of parts that we don't need. Windows, lights, interior, and other various parts are for sale. All sales help out Festiva Racing. Click here to view listing.